Image 1 of 11: The private pool at Quarter Deck is surrounded by a large pool deck and patio with gardens to the East and the Caribbean Sea to the North. There are sunny and shaded areas, making it a perfect place for all to relax. The North East Tradewinds sweep across this area, so it is very comfortable. 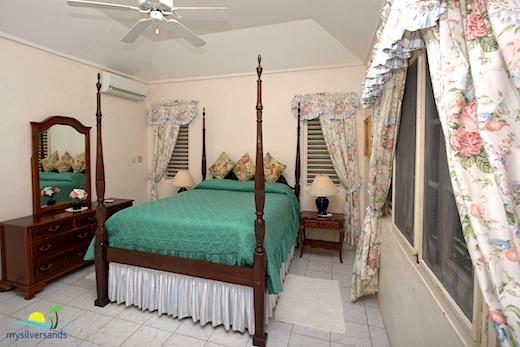 2 of 11: The master bedroom at Quarter Deck is air-conditioned and beautifully furnished with a four poster queen size bed. As you can see in the photograph, the room is beautifully decorated. There is ventilation on three sides and there is a ceiling fan. 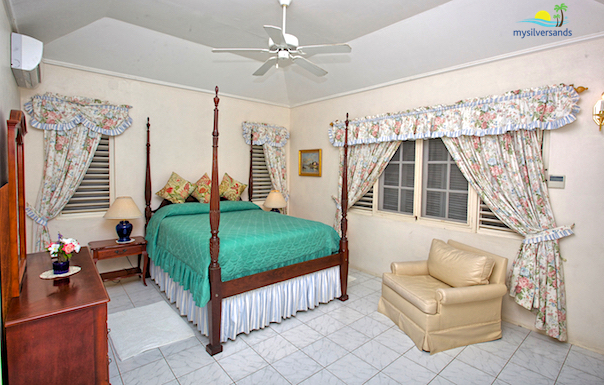 The bedroom is serviced by an en suite bathroom equipped with shower over bathtub. 3 of 11: The living room at Quarter Deck is spacious and very comfortable. Beautifully furnished and decorated, the room opens out to the verandah and pool deck to the North and to the separate dining room to the West. Ceramic tiles add a touch of elegance. There is cable television, and stereo system with CD player and tape deck. 4 of 11: The dining room at Quarter Deck is spacious. 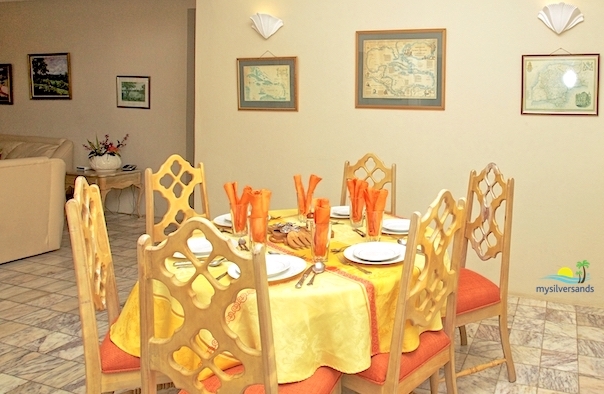 It is very comfortably furnished with a round pedestal table and beautiful high back chairs. 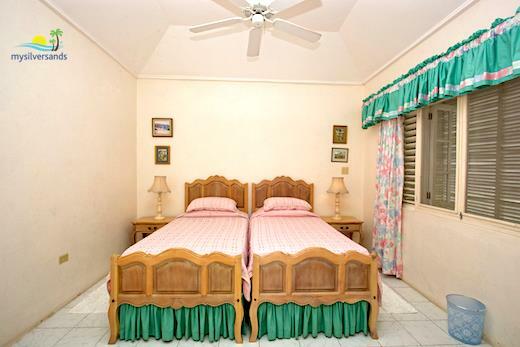 5 of 11: Furnished with twin beds and equipped with air-conditioning and a ceiling fan. 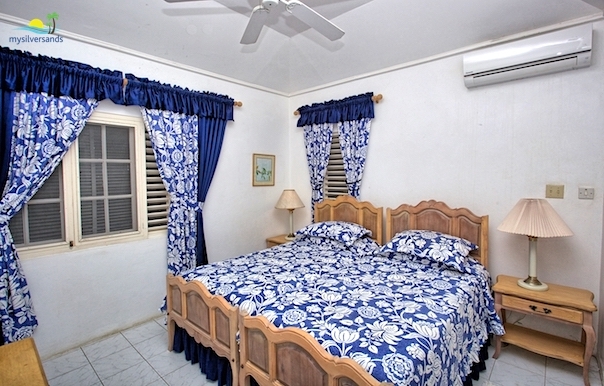 6 of 11: Furnished with twin beds and equipped with air-conditioning and a ceiling fan. 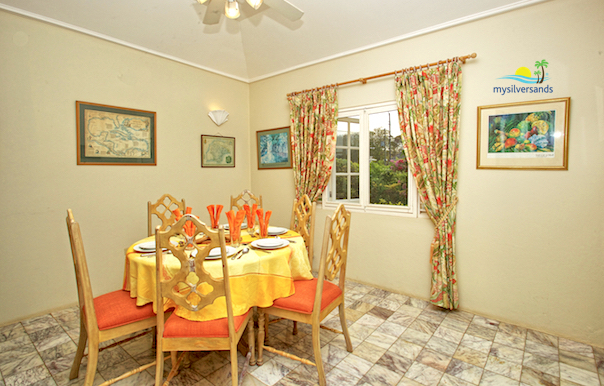 7 of 11: The Dining Room is conveniently situated adjacent the Kitchen and the Living Room. 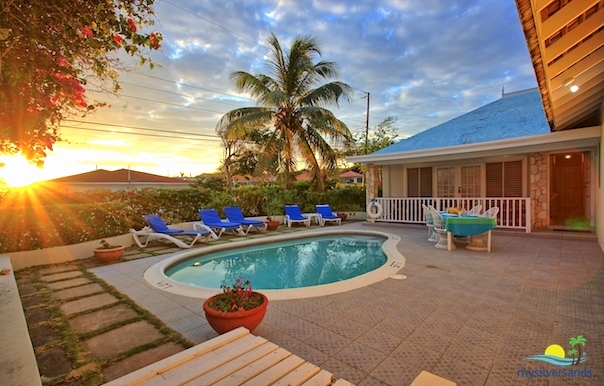 8 of 11: Quarter Deck Villa at sunrise. 9 of 11: Spacious area with rain and handheld shower heads. Double basins. 10 of 11: Elegant. Spacious area with rain and handheld shower heads. 11 of 11: Spacious area with rain and handheld shower heads. Email us for a 1 night stay at only US$350. Pool deck with sunny and shaded areas. 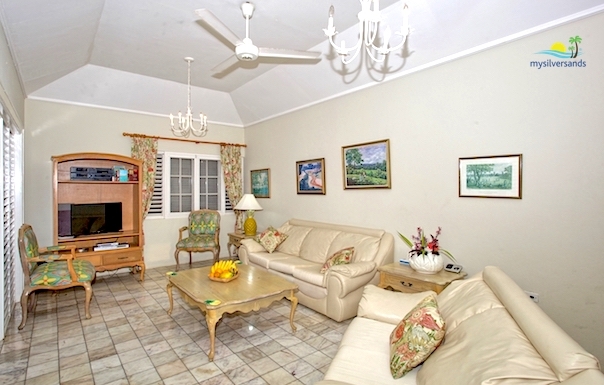 Spacious and comfortable living room and separate dining room area. Equipped with Cable TV, CD stereo system with double tape deck, radio, telephone. 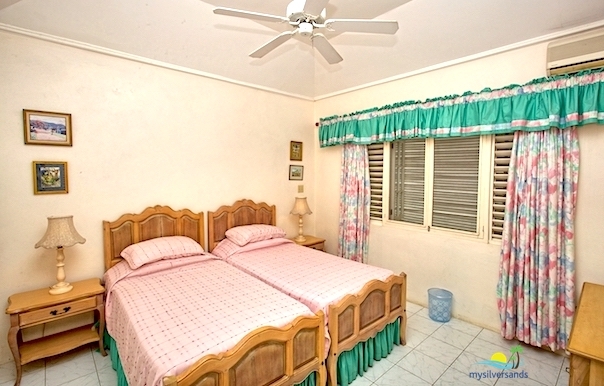 All bedrooms are air-conditioned and furnished with dressers, mirror, night tables, and reading lights. Living room opens out to the verandah which flows to the pool deck. Surrounded by landscaped tropical garden. 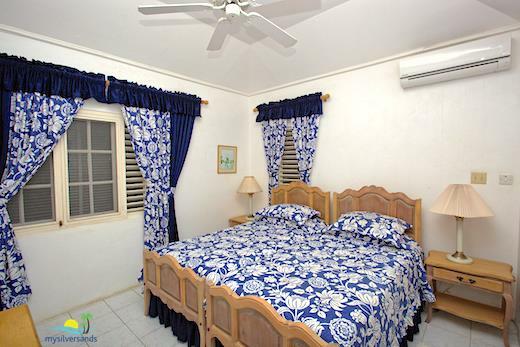 Quarter Deck Villa costs from $220.00 per night. 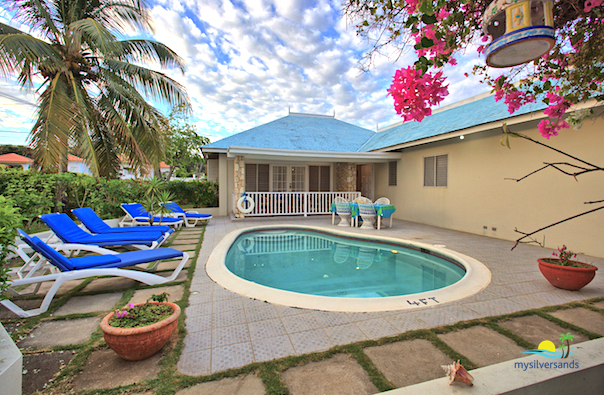 Mysilversands Limited Terms and Conditions for Quarter Deck Villa at Silver Sands Jamaica. Terms and Conditions for other accommodations vary. 50% refund up until 1 week prior to arrival, less $50 Service Charge. Your payments will only be refunded in full if we are unable to provide the accommodation for reasons beyond our reasonable control. For a 50% refund of the cost of accommodation, cancellation must be made seven full days prior to local check-in time on the day of check-in, otherwise no refund. For example, if check-in is on Sunday, cancel by Sunday of the previous week before check in time in order to qualify for 50% refund less $50 Service Charge. If the you cancel less than 7 days in advance, there is no refund. If you check in and decide to leave early, there is no refund.